Deleting a member will permanently remove that persons record from the database, preventing them from being able to login and preventing your organisation from being able to access their contact details and any attached notes going forward. For audit purposes, any transaction data such as Subscription Payments, Shop Orders or Events Entries will remain within the individual modules. 1. 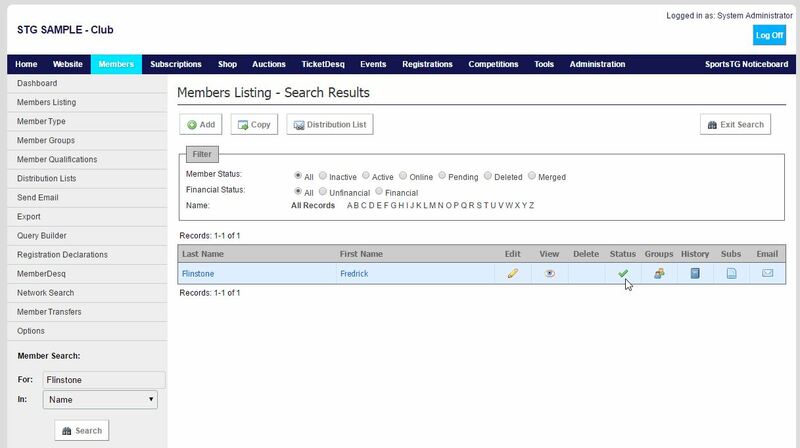 Within the Management Console, select Members from the top menu, then Members Listing from the left menu. 2. Search for the member that you wish to remove within the database. 3. Once found, click on Status icon next to the member's name. This should change them from an Active Status (green tick) to an Inactive Status (red cross). 4. When the member is inactive, click on the Delete icon which will now appear in the Delete column next to the member's name. 5. Click on Delete Record to confirm that you wish to delete the member from your database. Note: Deleting a member is permanent and we would always recommend that rather than deleting a member, you stop at Step 3 and set the member to inactive within your database. Once a member has been deleted, their information cannot be recovered.